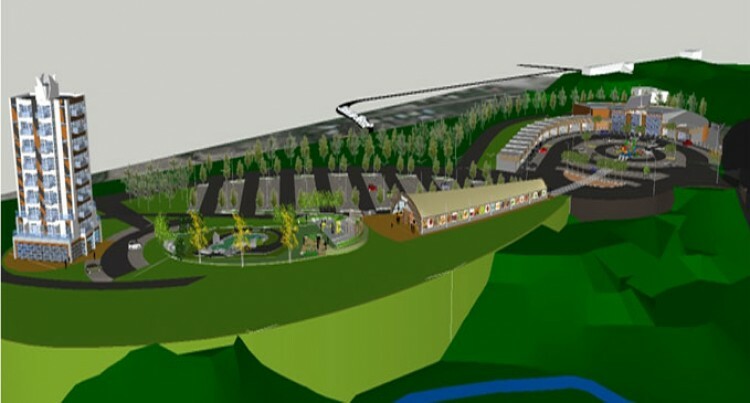 An artist’s impression of the development. The Fiji Muslim League has announced major commercial development plans for its 55-acre land bordering on Suva’s Ratu Mara Road and Bay View Heights. The project, launched yesterday at the Fiji Muslim League Headquarters, has been enabled through a partnership with Jeddah-based Islamic Development Bank. The initial capital injection will be $30 million. The freehold land was acquired back in the 1960s. The fact that an offshore bank was a partner in the project spoke volumes of the bank’s confidence in Fiji, said Muslim League president Hafizud Khan. The project, featuring state-of-the-art facilities is part of the League’s commitment not only to the Muslim community but to the Fijian economy, Mr Khan said. “The actual discussion with Islamic Development Bank started two years ago and the Islamic Development Bank has agreed to assist in this development,” he said. While the project may have been a longtime coming, he said it was materialising the foresight their predecessors had of the property. The development is set to house space for apartments and shops which it expects to derive its income bringing opportunities for substantial employment when it takes off. Mr Khan said: “Indication from the Government over the years is that they will come to our assistance in relocation if we have a major project on hand. “It’s not designed only for Muslims, it’s designed for the general public at large obviously with the cleanness, safety and security of whatever products that are being sold there. The property currently has Suva Muslim College, Suva Muslim Primary School and the Islamic Institute of the South Pacific Boys and Fatima Girls Hostel. The Government has a major road project through the land and this will give the Project an additional boost which augurs well for its strategic location. The section earmarked for this Project is presently used by squatters. “Through various meetings with the Police and squatters, Fiji Muslim League has made it clear that squatters will be moved once we commence this Project. Fiji Muslim League will await Government and authority approvals with expectations of the project to begin in mid-year. Meanwhile Mr Khan has become the first Fijian to be a non-member-country board member for the Bank. The Fiji Muslim League said this again spoke volumes of the impact Fiji is beginning to have on the world stage.